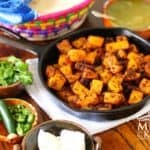 Papas con chorizo or chorizo con papas means Mexican Sausage with potatoes, it is one easy & tasty dish that you and your family will love and add to your list of favorites. 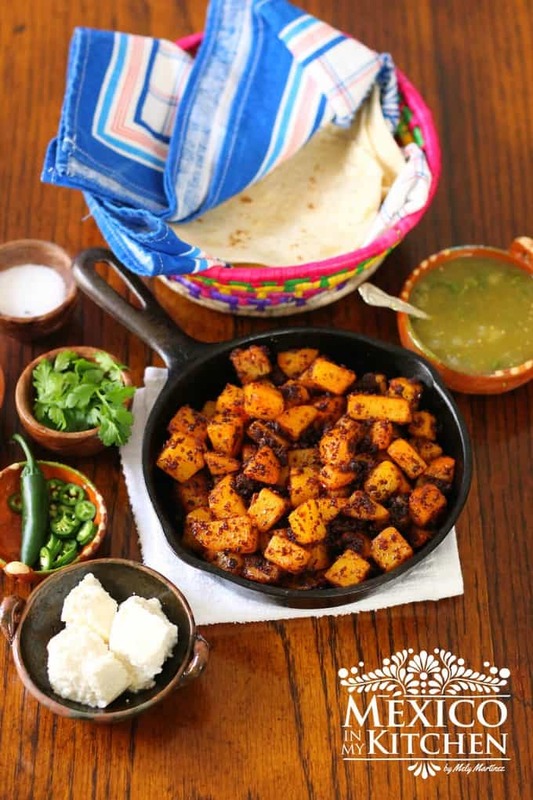 Chorizo con Papas or papas con chorizo means Mexican Sausage with potatoes, but anyway you name it is one easy & tasty dish you and your family will love and add to your list of favorites. I had mentioned before that growing up in a large family; my mom would add all kind of vegetables to most of the meals to last for everyone. But, we as a kid prefer potatoes that carrots and cabbage. She even added diced potatoes to the rice, but my favorite way to eat potatoes was and still is with chorizo. 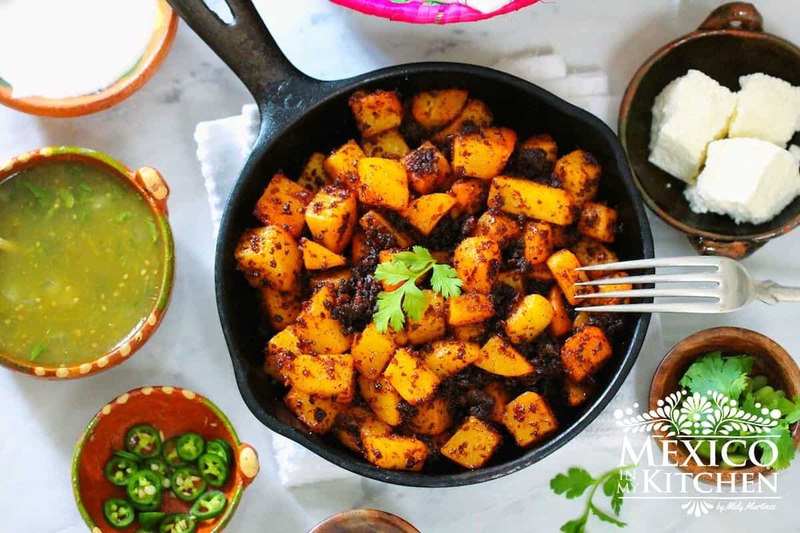 We eat “Papas con chorizo” in so many ways in our cuisines, and it is used as a stuffing for tacos, for pambazos, gorditas, sopes, burritos, quesadillas, tostadas, enchiladas, and many other dishes. Like those Papas with chorizo sandwiches, I used to take to middle school for lunch. My classmates loved when it was my turn to bring lunch for a team of four. Our lunch was Chorizo con papas in a crusty Mexican roll with a spicy salsa a satisfying meal at midway during my school days. 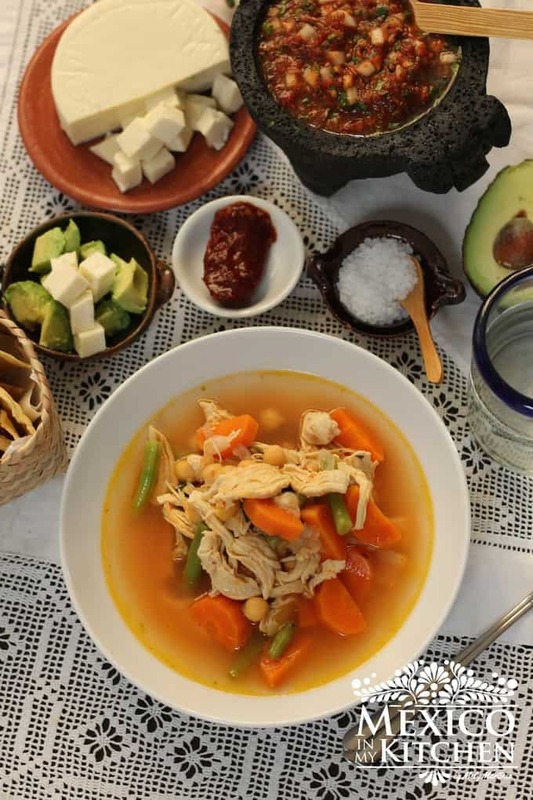 To make this dish make sure you buy good quality Mexican Chorizo, one that you can smell its aroma when you buy it, and if you would like to venture to make your own, there is a recipe to make it here on the blog. You have to cook Mexican chorizo before eating it. Its soft texture generally precludes it’s being sliced or eaten with the casing on, so this sausage is taken out of its casing—if it was even packaged into one—and fried before consuming or using in a recipe, for example, to prepare this “Chorizo con Papas” (chorizo and potatoes) recipe. Mexican chorizo is fried in a skillet, separating the chunks with a fork or other utensil so that all the meat is evenly cooked and its ground character is apparent. Any excess grease is usually poured off before the meat is eaten. Of course, not all the chorizo in the market had the same amount of fat. This fat (grease) from the chorizo is often used for other purposes, in a way similar to how bacon grease is prized for seasoning other dishes; its sharp, spicy flavor makes it an excellent element for combining (in relatively small quantities) with other ingredients, such as refried beans, lentils soups, eggs, potatoes, etc. Chorizo with scrambled eggs is a typical example of a typical Mexican breakfast, as is refried beans flavored with the sausage. 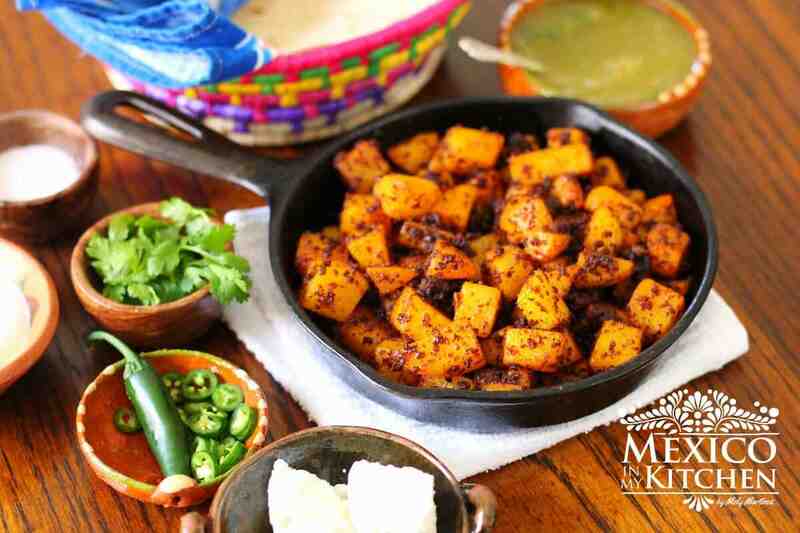 When making this dish of “papas con chorizo,” sometimes I skip boiling the potatoes, once I cook the chorizo, I remove it from the frying pan and then add the diced potatoes to fry them and let them slowly cook until tender and then add the chorizo. 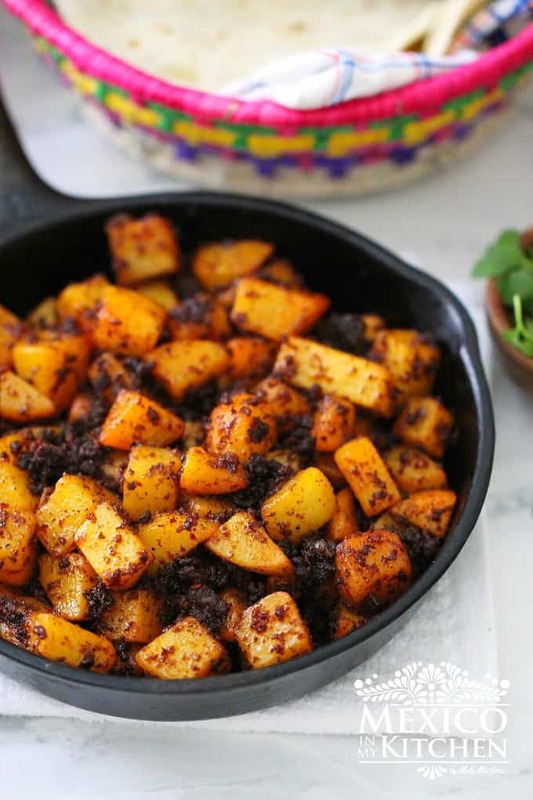 That is another option to make papas con chorizo. 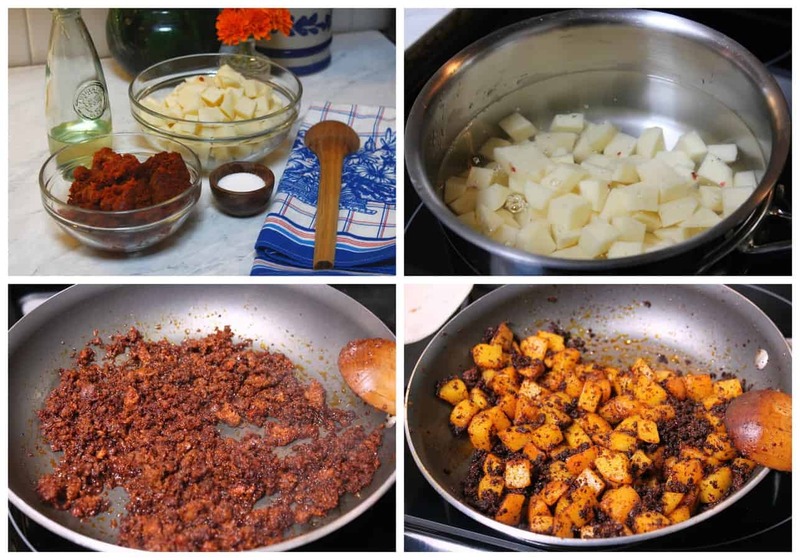 How to make chorizo con papas. Place potatoes in a saucepan and cover with water. Once the water comes to boil, cook the potatoes at medium heat for about 8 -10 minutes. The potatoes do not need to be thoroughly cooked, just tender. They will finish cooking in the frying pan with the chorizo later on. Drain the potatoes using a strainer and reserve. While the potatoes are cooking, heat the oil in a frying pan at medium heat. Remove the casing from the chorizo, crumble it and add to the frying pan to cook. Stir often to make sure it doesn’t stick to the pan, and it releases the tasty fat. This step will take about 8 minutes. Stir in potatoes and the onion (if using) and combine to allow all the chorizo flavors to coat the potatoes. Add more oil if need, to finish to cook the potatoes and to avoid them from sticking to the pan. Season your Chorizo con papas with salt. 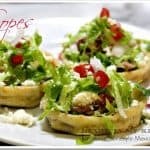 Warm corn or flour tortillas to serve. A spicy salsa or fresh Serrano pepper finely chopped. 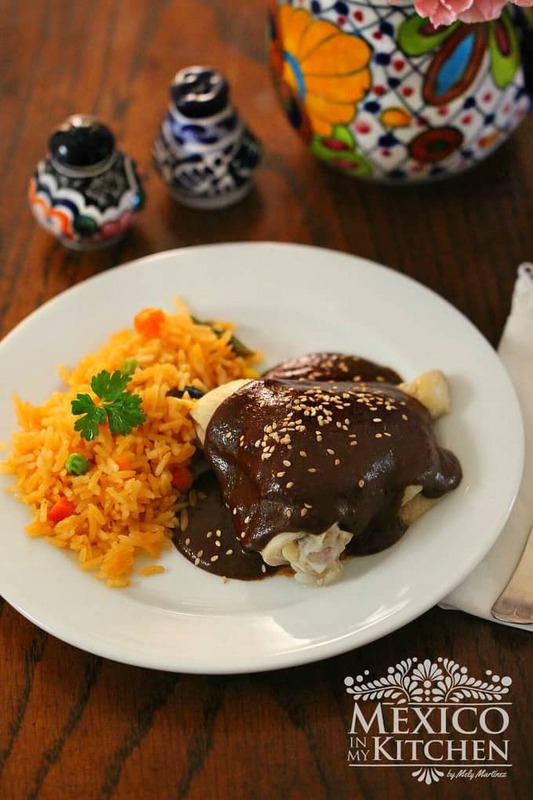 Use this dish as a filling for many Mexican Antojitos, like gorditas, tacos, burritos, empanadas, and enchiladas. Do you have a favorite way to use it? Please share in the comment section. Last nights dinner topped with an over easy egg….